The last week in July has been a momentous occasion on Chincoteague Island for nearly a century. Each year this small island on the Atlantic Ocean becomes pony central. The week-long Pony Penning celebration marks the annual journey of the Chincoteague Ponies from Assateague Island to Chincoteague Island. The herd is rounded up, herded across the channel, foals are auctioned off and then the herd swims back. 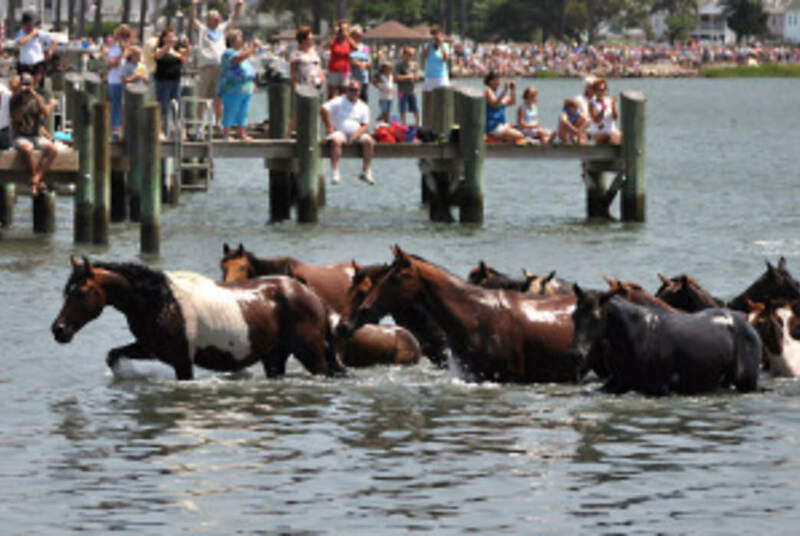 The crowning event of this week is known as Pony Swim when the ponies swim from Assateague to Chincoteague. 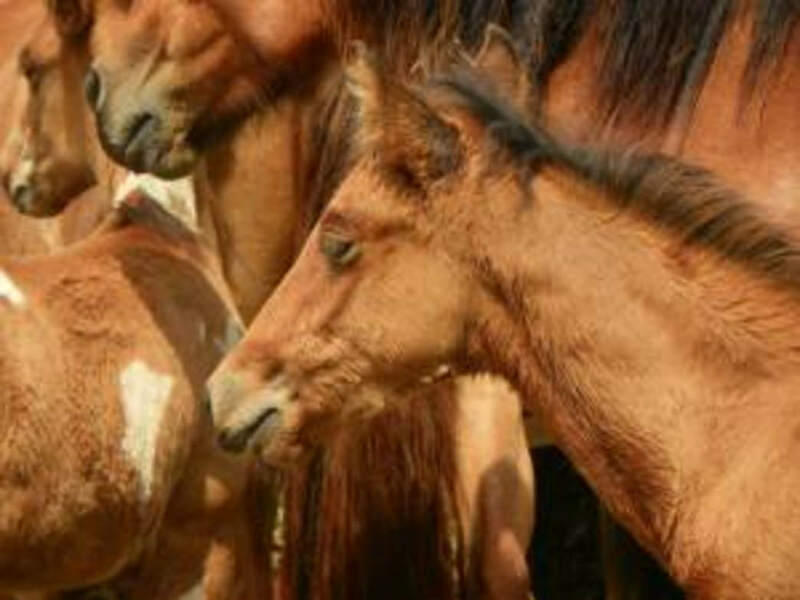 It’s a chance to see Chincoteague ponies up close and in action, but July isn’t the only time you can see the ponies. 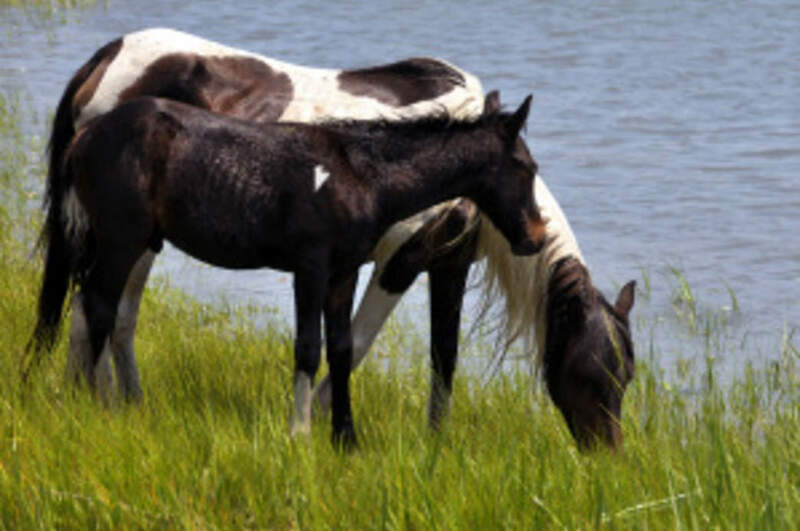 Here are the best ways to see Chincoteague ponies during Pony Penning week and the rest of the year. Monday Morning Beach Walk : Watch the ponies from the northern herd make their march down the beach at Assateague Island National Seashore to join the southern herd. Find a spot in the sand north of the parking lots at Assateague by 6 a.m. for a great view. Pony Swim : Thousands of people flock to watch this so here are some tips for the best viewing spots. *_Pony Swim Lane *_offers the best view of the ponies as they come up out of the channel onto a small patch of marsh separated from the crowd only by a line of construction fencing. You literally will be face-to-face with ponies, but it is not without challenges. The earlier you arrive, the closer to the ponies you will be, so this spot requires an early bird spirit. Wear clothes and shoes that you aren’t particularly attached to. It’s very marshy so you will get muddy. Bug spray is a must, other handy items include sunscreen, binoculars and water. Find a spot at Memorial Park about 100 yards from Pony Swim Lane where the ponies land. In exchange for sacrificing proximity to the ponies, you gain dry land. Some say the view from Memorial Park is just as good as that of Pony Swim Lane, but bring binoculars to get a close-up on the ponies. From the water is where old pros at Pony Penning watch. There are a variety of ways to accomplish that. Paddle your kayak up to the area where the ponies swim or book a seat with a local boat captain. Boats fill up quickly, so book your spot months in advance. When booking a boat for Pony Swim, ensure that the captain is licensed, and the boat has been inspected by the Coast Guard. If you’d like to launch your own boat and join the action make sure to obtain a permit from the town office. Pony Parade : After the ponies swim across the channel to Chincoteague, they parade down Main Street to the Chincoteague Carnival Grounds. Claim a spot on the sidewalk between Pony Swim Lane and the carnival grounds and wait patiently for the ponies to make their way past. Pony Auction : The last Thursday in July is the Pony Auction. At 8 a.m. the auctioneer starts the bidding on the foals that were born into the herd during the last year. Get to the carnival grounds early to get a good seat. These feisty ponies can put up a fight from time to time and their antics can make for an interesting morning. 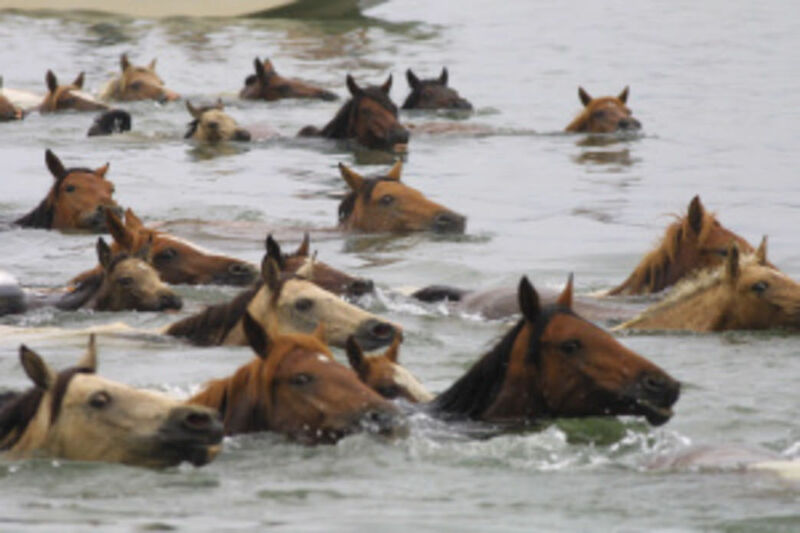 Return Swim : The adult ponies swim back to Assateague Island on Friday. The time varies each year but is announced on the Chincoteague Volunteer Fire Company’s Facebook page before the swim. Smaller crowds offer a better view and more intimate experience for the Friday swim. Spring and Fall Roundups : In April and October the Chincoteague Volunteer Fire Company rounds up the ponies for vet checks. During these roundup weekends the southern herd is rounded up and corralled on Friday and the northern herd is rounded up on Saturday. The southern herd is the easiest to see because their corral borders the main road into the Chincoteague National Wildlife Refuge. The northern herd’s corral can only be accessed by walking three miles up a service road or by taking the Wildlife Refuge Bus Tour. Pony Tours : Throughout the spring, summer and fall guides around Chincoteague offer tours on the water that get you close to the ponies. You can see the ponies by kayak or boat. Some guides offer deals that guarantee pony sightings with a money-back guarantee. Chincoteague Pony Centre : Have you ever dreamed of cuddling or even riding a Chincoteague Pony? The Chincoteague Pony Centre can hook you up. Ponies are housed in corrals out front for visitors to pet, ride, take pictures with and gaze upon. You can also wander around the stables and check out the closest remaining descendants of Misty, the pony made famous by Marguerite Henry. Written by EasternShore VA RootsRated for Visit Eastern Shore VA. The Eastern Shore of Virginia features the longest stretch of wild coastline remaining on the entire East Coast. Within an easy drive from urban centers the Eastern Shore is home to the car-less island of Tangier, over a dozen undeveloped seaside barrier islands, award-winning wineries, and historic waterfront towns like charming Cape Charles and Onancock.